Maybe this post should actually be called ‘why I like Mr. Darcy,’ but I flatter myself these reasons might be shared by other females. Mr. Darcy gets a lot of flak from guys. He’s just some woman’s imagination of the perfect guy, no real guy acts like that, women in general should just grow up and settle for reality (etc., etc.) And, well, some reasons for liking him are a little flimsy. He’s good-looking? Well, he’s a literary character, so you get to imagine him as good-looking as you like (and while the novel does describe him as handsome, the bad boy of the book, Wickham, is called more handsome). You could point out he’s rich, or that he’s well-mannered, but run the risk of being called mercenary, or looking like you want every guy to throw his coat over a puddle for you. No, there’s several very good reasons for enjoying Mr. Darcy in Pride and Prejudice, and I shall list them below. Oh, Mr. Darcy, you too? A man described as handsome and rich, who still fumbles around in conversations with strangers? Well, then, I feel a bit better at possessing this flaw myself. If you can’t think of anything to talk about, why should someone so much less interesting as myself, ever be good at it? You don’t know how many times I’ve stood across from someone for many long, awkward minutes, with my mind going a mile a minute and still not having a word to say. While everyone around me can strike up a conversation without any effort at all. I’m afraid I come off rude sometimes too, without meaning to be. Hopefully I don’t come off as proud. That’s what everyone Elizabeth knows first thinks of Darcy. Yes, Jane Austen gave me something to relate to in her hero, and this is one big reason I can get on board with the whole Pride and Prejudice fan bandwagon. Mr. Darcy does not wait around ninety percent of the book, too scared to find out what the heroine thinks of him (which too many romance novels do). Jane Austen is not fumbling around for some device to drag out her plot, and does not decide to make him get this close to saying something to Elizabeth, before being frustratingly interrupted. No, he actually gets up and walks over to where Elizabeth is staying, and asks her to marry him. (Okay, it’s be a bit strange if a guy who liked you just straight-up proposed to you nowadays, but at least Elizabeth isn’t in the dark about how he feels). And – take note of this, guys – he does get brutally shot down. But at least he took the risk. And the plot moves on! When females try to explain to males what Mr. Darcy’s attraction is, they don’t often explain this, but I think it plays a role. None of this ‘secret admirer for years’ stuff. He’ll actually tell you to your face how he’s feeling. This might be a point for the writer in me, but I love how Mr. Darcy is not a perfect paragon of virtue, and it is his very flaws that separate him from Elizabeth for most of the novel. They always tell writers that heroes that are too perfect are boring to read about. Yet, for some reason, romance novels still keep pulling out endlessly romantic and caring dudes with rippling abs. Even when the heroine gives the guy ample reason to throw in the towel! But no, this guy is sincere and loves the girl for who she is… blah, blah, blah. Anyway, this point directly contradicts the charge that Mr. Darcy is “too unrealistic.” I’ll admit finding a good-looking, virtuous guy who also happens to be rich is stretching things a little far, but the fact he has flaws makes him more believable. He can’t quite take a joke, not even by the end of the novel. And he is proud. He tones it down a bit by the end, but he has pride in spades. This gets toned down a bit in the movie adaptions, I think (at least in the Keira Knightley one), but for a long time he was not ashamed at all for breaking up Jane and Bingley because he really thought Jane was beneath Bingley. He actually, while proposing to Elizabeth, spends a long chunk of time describing how he’s lowering himself to do so (you wonder why she shot him down, huh?) In his letter to her, he still insists he did right by Bingley. And by the end, he still can’t quite take all of Elizabeth’s teasing, as I mentioned before. At least he’s consistent. “Love” doesn’t turn him into the opposite of everything he’d been throughout the book before – unfortunately, I’ve seen this happen in too many novels before too. Anyway, there’s my two cents on that. Are there any more reasons you can add? If some of the things that happen in romance novels happened to me in real life, I’d probably run the other way. It might make sense in the tightly structured, well-plotted world of the novel, but in the messy real world, not so much. After all, real life doesn’t have a plot, and it has far more dead ends and far less plot armour. But my main point is this: some things that in books make me go awwwwwwww, would make me feel horribly uncomfortable and awkward in real life. And this is okay, as long as you recognize it – fiction is not real life, and awareness of the gap between the two is essential (otherwise you’ll be wishing to live in a dream world). And it’s good for authors to know this too. Some things that sound ridiculous if they were to happen to you today, may very well be the perfect addition to your story. Fiction, after all, is all about exaggeration. In real life, I’d want a guy to do stuff that shows he thinks about me and cares about me, but not to go over the top. Not to do something crazy to prove to the whole world how WONDERFUL our relationship is, and how utterly devoted we are to each other. 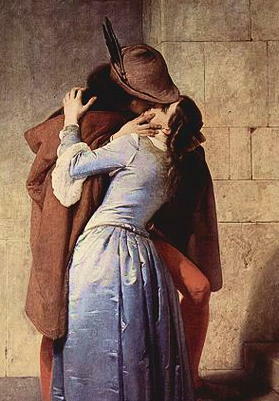 Fictional relationships are three-way relationships, with the couple mainly performing actions for the benefit of the reader. The characters have to exaggerate in fiction, to bang into the poor reader’s head that this is ‘true love.’ But in real life, I’d hope we wouldn’t have to put on a show for anyone. It’s enough that just me and the guy I like know. Those are my thoughts on reality vs. fiction in romance – what’s yours? There are a couple typical plots for romance novels, but most of them go something like this: Girl is frustrated at being single/sick of dating jerks/doesn’t have time for romance. Girl and Guy meet cute. Girl and Guy hate each other for some contrived reason (usually one of them is arrogant). Somehow they’re attracted anyway. They fall in love. Something happens to separate them (Lies! Misunderstandings! He’s actually a reporter in disguise! She spies him having dinner with a beautiful women who turns out to be his sister!) And once this simple barrier is overturned, after many, many pages of anguished heart-searching on the part of both of the Guy and the Girl, they realize that they are each other’s True Love and they get together. Forever, unless it’s a more modern, more cynical work. My problem is that so often books skip over why they are attracted to each other in the first place. Usually if they start by hating each other, the author explicitly points out that they are irrationally attracted to each other anyway, and at some point this irrational attraction overrules their better judgement and they get closer to each other. So, pretty much these romances are based on the fact that one character is a guy and one character is a girl, and thus they must be inherently attracted. The flaw in this plan, I think, is that not every girl and guy is attracted to each other. Especially if they’ve given each other good reason to hate each other. After all, I don’t fall in love with every arrogant jerk I run into. To me, using random irrational forces of attraction to get a couple together is a cop-out for the author. It was magic, I swear! I get the feeling that often the authors are not very committed to making their characters truly dislike each other. Because the author is pretty much in love with one character or another anyway, so of course their destined romantic partner will be too. Unfortunately, in real life, if you don’t like someone you usually need pretty strong evidence before you change your mind. Otherwise this dislike is merely a formality the romance novel has to get over – a puny little barrier that can be knocked over with one hand. Honestly, I’ve read far too many books where once the ‘meet cute’ and ‘initial dislike’ is over, the plot grinds to a complete halt. I read one novel where the couple got together in the exact middle, and nothing else happened until the second-last chapter! Really, chapter after chapter of idyllic romantic scenes, when you haven’t given me any insight into what these two characters like about each other (other than ‘she’s beautiful,’ and he’s ‘confidant and handsome’), is less than enthralling. And palm to palm is holy palmers’ kiss.) Or because it’s just thrilling that one is a Montague and the other is a Capulet? Sorry to harp on this particular couple so often, but they’ve been held up as the epitome of romantic love for so long, and I can’t understand why. To beat another dead horse, in Pride and Prejudice both Darcy and Elizabeth find each other somewhat attractive at first (she is “tolerable,” and he is a “fine, tall person, handsome features, noble mien”). Yet that does not prevent them from developing an intense dislike for each other – a dislike that takes the whole book to get over. That is character development. That is an obstacle to a romantic relationship that is not minimized by saying, “love conquers all,” (which is not true, anyway), but by treating it realistically. Okay, so sometimes people are irrationally attracted, and sometimes they are stupid and get together with someone against their better judgement. Unfortunately, this usually ends in tragedy, not the run-of-the-mill happy endings applied to every romance novel. Maybe I’ve just been reading really bad novels. Have you read any that were better than this?